Pat Musick’s iconic series The Shape of Her Words will be exhibited at the Equinox Village Gallery, 49 Maple Street in Manchester Center, VT from September 20 through October15. The series was inspired by the poem On the Pulse of Morning written and read by Maya Angelou on the occasion of Bill Clinton’s first inauguration as President of the United States. Musick was deeply affected by the haunting nature of the words, the way in which they addressed themes that run through her visual art world and her concerns with the needs of our planet and its inhabitants. She decided to look at the words as though they were symbols painted on a blank canvas. Pat first drew an outline around the shape that each stanza made on the paper, which divided it into a positive (the image) and negative (the remaining blank) space. 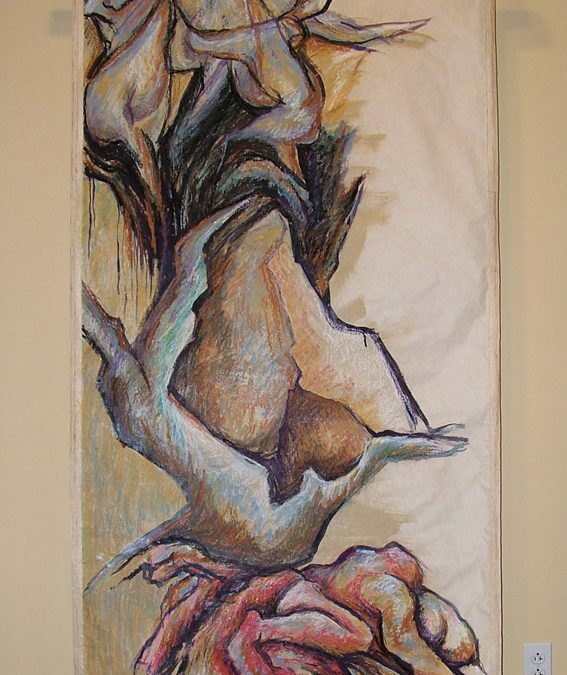 She then enlarged this outline onto 72”x39” sheets of handmade kozo paper, transferred the outline to the paper and began to paint visual interpretations of the poem’s message within the form. The end result was the poem interpreted visually within the shape of her words. When the six large scale works were completed, Musick created six smaller pieces which are shown in the exhibit. The exhibit also includes education panels which portray the poem and describe her thoughts and creative processes. The result is a powerful statement that resonates today twenty-five years after the inaugural event. Angelou’s words transcend history and have meaning for our lives in today’s world. The color range evokes emotion ranging from joy to tragedy, the broad powerful brushwork is full of the action of history, and taken together in an exhibit they form a book, a story from which we can all learn.